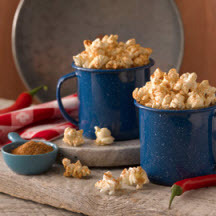 Keep this tasty barbecue seasoning mix on hand to easily turn plain popcorn into an extra special treat. To use: Spray popped popcorn with cooking spray. Sprinkle about 2 teaspoons of seasoning mix for each quart of popcorn. Makes about 1/3 cup seasoning mix.